Automation technology is being combined with the ancient craft of barrel-making at a Scottish cooperage, where two robots and a purpose-designed lathe are being used to refurbish traditionally built oak barrels. Every year, the Scottish barrel-maker, Speyside Cooperage, manufactures and refurbishes more than 100,000 oak barrels in its factories at Speyside and Alloa. Refurbishing oak barrels is an important part of the whisky industry for two key reasons. First, barrels previously used to hold other liquids, such as sherry, are subsequently used to mature whisky to provide unique flavours. And second, whisky barrels often need to be repaired after about ten years of use, to allow their continued use. Although everyone working at Speyside Cooperage is either a qualified or apprentice cooper, the company is open to adopting machinery and technologies that could boost output and improve health and safety. There is growing trend in the whisky industry to refurbish both ends – or “heads” – of a barrel as part of the refurbishment process. Speyside decided to investigate the possibility of automating the process of removing up to 3mm from the barrels’ internal diameter and handling them through a charring process after machining. It approached a specialist firm Aberlour Engineering to design a system that could perform these tasks automatically. “Traditionally, the refurbishment process requires ‘dropping out’ only one end of the barrel using a lance burner and scouring the inside of the barrel with a rotary wire brush,” explains Speyside Cooperage’s manager, Steven Langlands. “Increasingly, our customers are requiring both ends to be removed, and a shaving to be taken from the internal diameter to clean the surface. Aberlour designed a system based on a horizontal lathe with powered tailstocks and two 300kg-payload Kawasaki ZX300S robots to load and unload the barrels. The load robot picks a barrel from an infeed position and places it in the horizontal lathe. After the barrel has been machined, the unload robot removes it and inverts it over a collector unit that catches the wood shavings. The robot then places the barrel onto a conveyor that transports it through the charring process. This process opens up the newly machined wood grain to allow it to absorb moisture as part of the wood's sealing process. 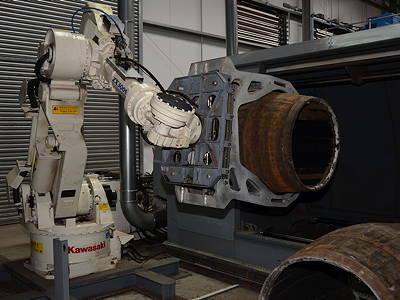 After the charring process, the barrel is removed by the robot and placed onto an output conveyor. Using one gripper design for four barrel variants, the system takes 15 minutes to change the lathe tooling which comprises a cone on each tailstock. “When the decision was made to refurbish by dropping both ends, we assumed that the process time would be extended above the existing one-end manual operation,” Langalnd recalls. “In fact, the new process is far quicker. The system effectively increases our capacity – subject to feeding it enough barrels. The system needs just one operator and Speyside Cooperage has found that a half a day of robot training is sufficient.